DARWIN Providers do NOT manage investors’ capital themselves. They provide the "what and when to buy/sell" to Darwinex in exchange for a 20% performance fee on profits generated for investors, whereas Darwinex decides "how much to buy/sell". Therefore, DARWINs are managed by Darwinex, an asset manager regulated by the Financial Conduct Authority of the United Kingdom. A DARWIN is an investable asset based on a trading strategy run on a live Darwinex Metatrader account. Therefore, you need to own a live Darwinex MT4 or MT5 account in order to be able to create a DARWIN. Demo Metatrader accounts are not eligible for DARWIN creation because, on the one hand, demo accounts do not experience slippage like real accounts do and, on the other hand, the trader does not risk his or her own capital when trading on a demo account; it would not be fair to ask investors to risk their capital on a strategy on which the trader does not risk his or her own capital. You may ask why it's necessary to trade with Darwinex as your broker in order to list a DARWIN. On the one hand, trading with Darwinex reduces latency between the execution of the trader's trades and the execution of investors' trades replicating the trader. Having to receive trade information from other brokers' servers, latency and thus investor divergence, would be higher. On the other hand, depending on other brokers for passing us trade information would create a dependency on third parties which would make our product less robust and more fragile. Finally, only if traders trade with us can we guarantee that their trading activity gets respected. Importing live trading history from an existing MT4 account you hold with another broker into a live Darwinex MT4 account. Linked accounts are not eligible for DARWIN creation. Your linked account must be imported first into a Darwinex MT4 account in order to become eligible. It is not possible to link and/or migrate live MT5 accounts yet. Experience level of the strategy is at least 0.5. When the Experience is below this threshold, you'll be shown the % of progress needed to reach it. Accounts containing SPA35 trades, while eligible for creating a DARWIN, won't be able to trade that asset once the DARWIN gets created. This is due to different opening hours; right now we can't guarantee that SPA35 trades get replicated under optimal conditions. We are working so that they can in the future, though. After this process, your DARWIN will not get created immediately. The DARWIN will get calculated over the following weekend, when the market is closed, and approved by Darwinex staff by Monday-Tuesday after that weekend. When this happens, you'll receive an email notification. If your trading account's history includes trades in the SPA35 CFDs, while past trades will get included into the DARWIN calculation, that asset will get disabled in the moment of DARWIN creation as it cannot be replicated yet for investors. Once your DARWIN gets listed, it is all set up to receive investment from Darwinex investors. 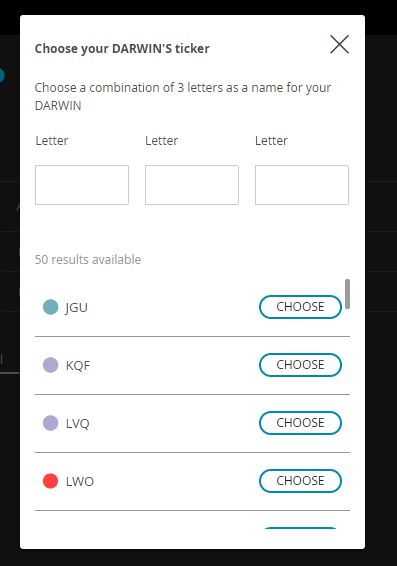 Your DARWIN will also automatically participate in the monthly DarwinIA trading contest. * Stock DARWINs are in beta mode and are not investable yet.